Boosting conversion rates, increasing business leads and achieving success! That means creating an effective and emotionally compelling case that showcases your product or service in the best possible light. 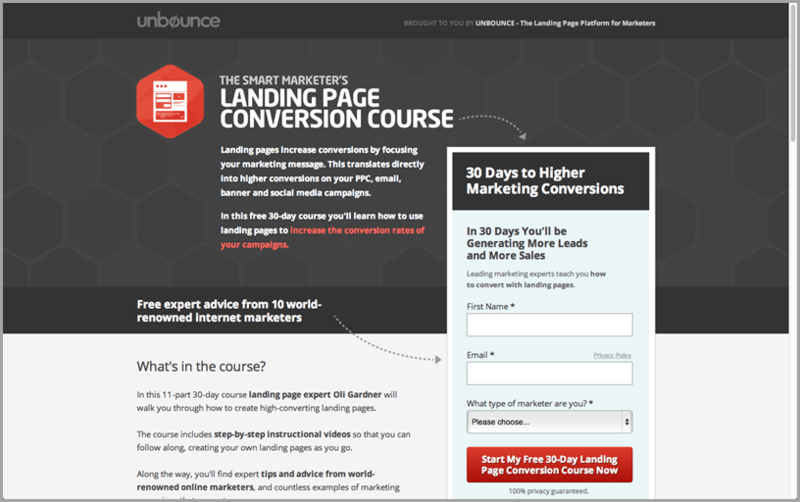 Here are 17 tricks to making any landing page convert. Let’s get started. Research shows that you have 0-8 seconds to capture a visitor’s interest with a compelling headline and landing page. After the eight seconds is up, most visitors leave. The headline is the first thing a visitor sees, ultimately deciding whether or not they want to stick around. When writing an effective headline, you should aim for a mix of contextual keywords paired with emotional elements to increase click-ability. Start with your focus keyword(s) and build emotional triggers around it, such as in the example below. If you’re looking for help, try out this tool from CoSchedule which will analyze your headline and provide insight into whether it’s good or bad. Landing page videos are more popular than ever. Product videos are a great way to entice and entertain a visitor. In fact, landing page videos have been shown to increase product purchases by 144%. Or… you can add an explainer video that introduces a visitor to you and your services in a no pressure way. How do I know? 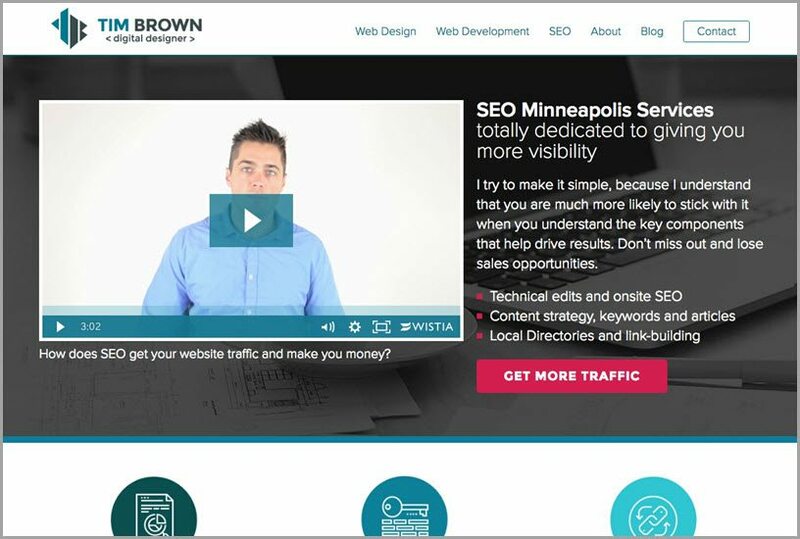 I launched this SEO Minneapolis landing page, and literally within hours it converted a visitor into a lead who became a very solid customer. People feel like they get to know you when they get introduced to you, your team, or your offer via video. It’s almost more intimate than any combination of photos and text that you could come up with. You could see more leads come in with long-form landing pages. It’s been shown that long landing pages can net 220% more leads than a primarily above-the-fold landing page. Make an outline of your goals and decide: Who is the content for? Why will it matter to your audience? What will make it successful? How will you measure it? Use keyword research to come up with new topics: Use Keyword Planner to see what people are searching for. Incorporate those keywords into the headers and copy on your page for improved SEO. Use current content to inform new content: Your highest-performing pages can inform you of new content ideas. What else can you say about the high-performers that people would be interested to know? It’s been shown that Companies with 40+ landing pages get 12 times more leads than those with 5 or less. Similar to how more content on landing pages improves performance, the more landing pages you can build, the better off you’ll be. A/B testing is key to making your landing pages convert, that’s a well known fact. But, this year it’s time to sharpen your game – time to step up to the big leagues. By doing this, you’re mixing together too much data which makes it much more complicated to understand. This is referred to as multivariate testing, because there’s more than one outcome to analyze. Many marketers will end a test as soon as they see positive results. You should instead give campaigns 3-4 weeks or more to gain a wider perspective. Even tests like Optimizely (my favorite A/B testing software) – might give you a ‘statistically significant’ positive test, but in reality you should wait a couple of weeks after this to implement based on the data. Don’t give up after you’ve run a successful A/B test. If you’ve found that one image works better than the other, does that mean you have the absolute best image? Maybe. Maybe not. Only by running more tests will you find out. 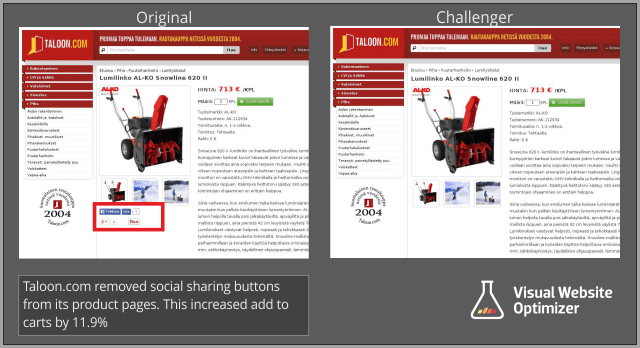 This A/B test from Visual Website Optimizer helps demonstrate why having social share buttons on product pages can distract from a visitor’s main objective of buying. This is a more subtle example of how multiple offers or objectives for a page can dilute the main purpose, which is talked about in more depth in Point 8. Should you place your CTA above the fold or below the fold? That depends on which type of campaign you’re running. In most cases, the natural response is to place the call-to-action above the fold, as it immediately draws your visitors’ attention to your primary message and contact button, which is always better for conversions in most cases. However, if your product is somewhat difficult to understand, like a software solution, you need to give your visitors the necessary details so they’ll click on your CTA. If they can’t understand your product, they won’t understand why they need to buy it. For every one-second delay in page response, there is a 7 percent decrease in conversion rate. Visitors want to find the information they’re looking for, quickly. If your landing page is frustratingly slow to load, analyze your content, and do whatever it takes to speed it up. To test your website’s mobile and desktop speed, use Google PageSpeed insights. All you need to do is plug in your website URL to get a quick rundown of your site speed and ways to improve it. Presenting multiple offers on a single landing page isn’t best practice. You should have one specific offer for each landing page to keep your prospect focused on one thing at a time. A landing page should be focused on a singular selling proposition, with your page’s CTA communicating it. Having multiple calls-to-action or USPs on your page dilutes your message and confuses the audience. Pages with multiple offers receive 266 percent leads less than pages that provide one stand-out offer, so you can see how important this is. With the correct targeting methods using buyer personas, you’ll have a better chance of improving landing page performance. Some tests have shown an increase in conversion rates of up to 300 percent. 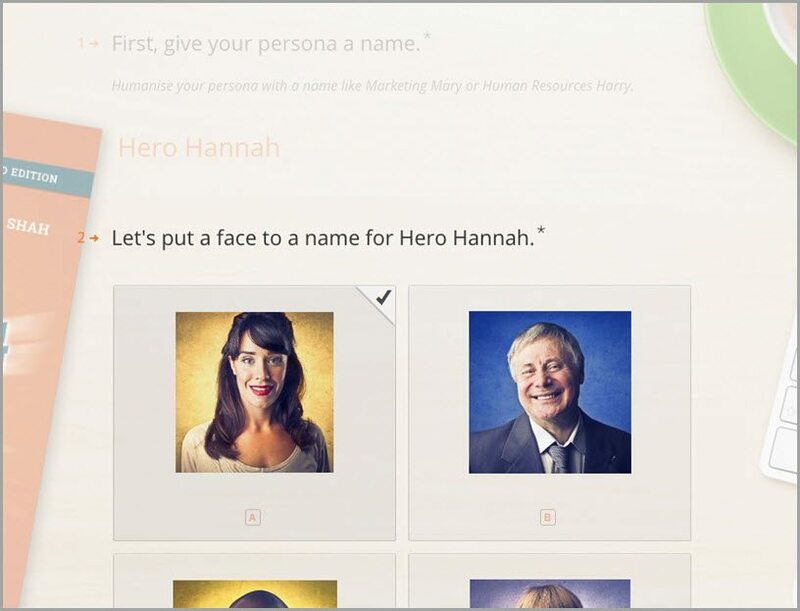 Try out this handy tool from HubSpot to build your first buyer persona. It has been slowly creeping up on us, but now the mobile tipping point has arrived. 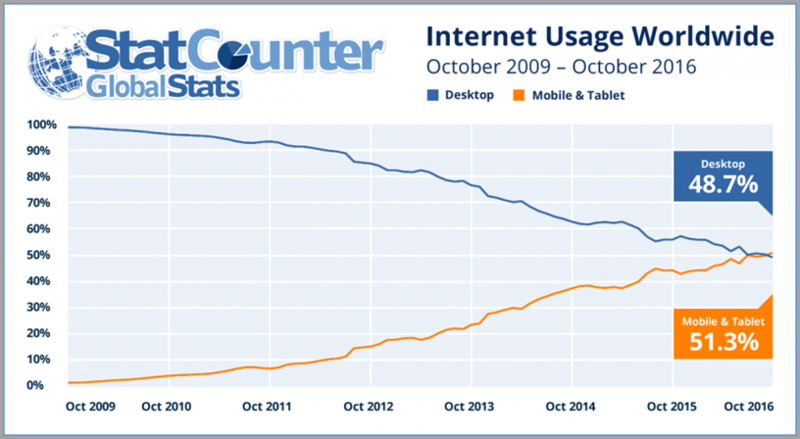 Just recently was the first time mobile traffic usage has exceeded desktop traffic usage worldwide. This means that if you’re not thinking mobile-first, you’re already headed for last place. Showing testimonials will help validate the information on your landing page. They allow prospects to overcome their perceived skepticism. Likewise, showing product or service benefits, social proof, and credibility indicators led to a 144.1% improvement on landing pages. Keeping form requirements short and displaying only the essentials is key to boosting conversions. It’s important to respect your user’s time, as they don’t want to sit there filling out a dozen fields. For example, take a look below at an Unbounce contact form, which only includes name, email and job title. When developing marketing campaigns, too often landing pages are just an afterthought. But, the landing page should be created in conjunction with your marketing efforts – especially if you’re conducting an email, direct mail, or PPC campaign in which you need to funnel people through a sales process. Photos shouldn’t be used on landing pages to fill empty space. They are there to add value to the overall user experience. The problem most companies face when building poorly-performing landing pages is that they use generic stock photos, when studies show that visitors mostly ignore generic photos. If you’re using a photo on your landing page, ensure that it has a purpose, or else remove it. Urgency is a critical part in pushing users past the purchase threshold. This is due to the idea of scarcity, in that consumers want what may soon be unavailable. Using language such as “One day only!” or “Last Chance!” will help increase that sense of urgency within the consumer’s mind. Everyone is attracted to a good discount. Shoppers don’t like to do math on the spot, so offering easy-to-understand discount offers, like 50 percent off or two-for-one, let’s them quickly understand the deal they’re receiving. If you’re providing mixed messages to the consumer throughout various marketing campaigns, you’ll create a sense of disconnect. Whether it’s PPC ad copy or a meta description in organic search results, the message and promise must align with what’s presented on the landing page. 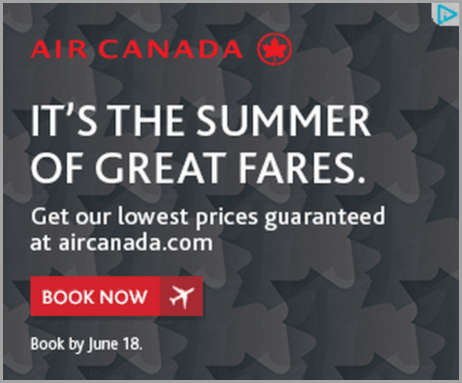 Take a look at Air Canada’s cohesive landing page campaign below for inspiration. Good luck getting massive conversion rates on your landing pages! As each new year progresses, new challenges and goals arise, and in terms of your website, improving your landing pages should be a top priority. Whether you’re a small business or a huge corporation, there’s never been a better time to begin optimizing your web content. Now that you know 17 tricks to build a perfect landing page, get out there and start winning over customers! Guest Author: Tim Brown is a web designer and developer also helping clients with Minneapolis SEO Services and focused on the disciplines helping clients drive traffic and increase conversion. You can tweet him at @timbdesignmpls. The post 17 Tricks for Boosting Conversions On Any Landing Page appeared first on Jeffbullas’s Blog.